Infrared Arthritis Gloves Half Finger offers an excellent coverage for hand and wrist while allowing fingers the freedom to operate and grip whatever necessary. The gloves increase blood circulation, stimulate tissue regeneration, reduce joint inflammation and relieve arthritic hand pain. A recommended compression for hands does not restrict blood flow. Infrared Arthritis Gloves Half Finger style offer a mild compression to help control inflammation, pain, stiffness, soreness and edema as main signs & symptoms of arthritis in hands, aging or injury. Made with non-toxic earth minerals (bio-ceramic fibers), these gloves are able to convert the body heat, even if we feel cold, into infrared energy. The far infrared rays help expand the small blood vessels, alleviate the pain and improve circulation in hand and fingers. A good circulation leads to faster recovery and healing or to manage most of hand problems in the comfort of your home. Infrared Arthritis Gloves Half Finger can be worn continually while you work doing repetitive tasks with hands and fingers, rest or sleep. You will feel a comfortable warming sensation that surrounds your hands with no adverse effects. Arthritis Gloves using infrared energy can also be used for poor circulation, hand neuropathy and other conditions or as a prevention and health care. Comfort is the key and to find the best comfort for your hand follow our simple size guide to decide which infrared arthritis gloves half finger will suit your hands best. 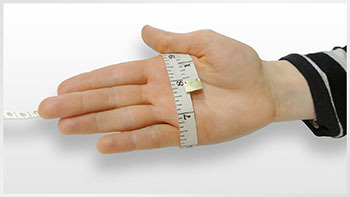 Please measure, in inches or centimeters, around your hand with a tape measure across your palm as illustrated. We recommend using your dominant hand, the right if you are right-handed, and the left if you are left-handed. Bio-ceramic fibers, thermo-reactive to emit infrared energy and able to perform a beneficial action to the human body. Unique Far Infrared Arthritis Gloves Half Finger with Celliant® (natural minerals blend) offer comfort and support for joint pain and inflammation while vasodilate blood vessels and increase oxygen supply to body cells. …I ordered the half finger gloves for my dad who has arthritic fingers and within 48 hours he is able to make a fist which he hasn’t been able to do for ages. Thank you for my gloves…..they arrived today, I’m wearing them and they are giving me relief even so soon. I love these gloves and am ordering more. I have basil thumb joint arthritis and these gloves have really made a difference. I can’t go to bed without them. I am also ordering a pair for driving. I highly recommend them! Just ordered my second set. Gloves work well and really great customer service! Bought a pair of these to help with my wrist injury; three severed tendons, one severed nerve. Excessive movement is prone to make 3 of my 5 fingers swell at the first knuckle. Works amazingly, have not had a swelling problem since, and extremely comfortable to boot. Only reason I didn’t rate 5 stars is because of the measuring system. My hand measures 20.5 cm in circumference (medium), but the gloves are incredibly loose on me. They’re actually prone to fall off when my hands are at my side idle, and often ride up when kept perpendicular at a keyboard for prolonged times. Had to re-order them in small for a snug fit. My advice would be to order a size down if you have slim/slender/boney hands like me – even if you’re at the top of the measurement range. After a few days of use, noticed improvement. Will order more items from Veturo. Bought these as my gaming gloves. Work awesome!